What good is wood in streams? The area burnt by the Pigeon Valley Fire. The unburnt area around the fire illustrates just how dry the vegetation was across the region. Wildfire is devastating. 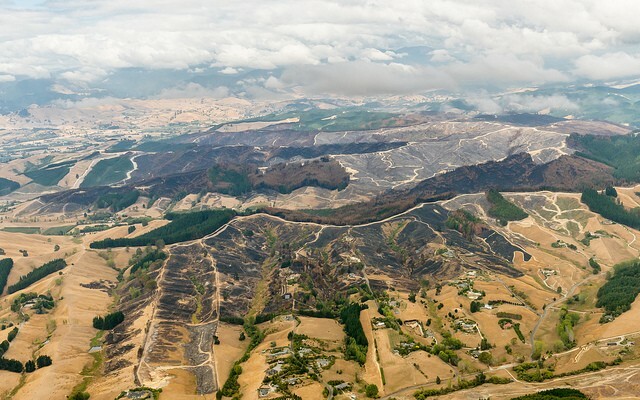 The Pigeon Valley fire that burned in the Nelson/Tasman region was one of the largest forest fires (2400 ha) New Zealand has seen in some time. It caused the evacuation of more than 3000 people and 700 livestock, featured nightly on the news and took over five days to be contained. These kinds of large, extreme fires are likely to increase with climate change. Our Rural Fire Research Team is amid a five-year programme funded by the Ministry for Business, Innovation and Employment (MBIE) called ‘Preparing NZ for Extreme Fire’. The goal of this research is to prepare New Zealand for a climate change-affected future, where fire danger is an increasingly large threat. The MBIE programme forms part of our wider rural fire research, which includes assisting rural fire managers to assess risk, predict the spread of fires, and manage the safety of firefighters and the public. On average, the Nelson/Tasman region experiences 9-10 days/year of very high and extreme forest fire danger. However, this year, the region had already experienced seven days of very high, and eight days of extreme forest fire danger during the first 35 days of the year, helped along by a heatwave and significant soil moisture deficits throughout the region. The very hot, dry and windy weather had a major effect on forest fuels, drying slash and prunings, understory vegetation, pine needle litter and organic material in the soil, all of which contribute to the amount of fuel available to burn. Dry and high fuel loads contribute to easy fire ignition, spread, and to high fire intensities. The Buildup Index (BUI) component, which describes the overall fuel dryness and amount of fuel available for consumption, shows the January 2019 levels of extreme dryness/risk at the Nelson Aero weather station. A BUI of 60 is very high, and 80 is extreme. This year the BUI reached 100 by the end of January, and continued to increase through February, reaching values over 140, levels which have not been seen since 2001. Fire dangers in the Nelson/Tasman region are predicted to increase with climate change. They could experience 12-13 days of very high and extreme forest fire danger on average each year. However, Nelson/ Tasman is not the only area with increasing fire risk. Modelling of potential future changes in fire danger with hotter, drier and windier conditions caused by climate change shows that the number of severe fire weather days is likely to increase around the country by an average of 70 per cent by 2040. The most marked relative changes are for Wellington and coastal Otago, where the number of severe fire weather days is likely to double to around 30, and triple to 20, per year respectively. “Areas like coastal Otago, which doesn’t often have to cope with wildfires, could be much more likely to face one in the future than Nelson/Tasman,” says Fire Scientist Grant Pearce. During the Pigeon Valley fire, Scion atmospheric scientists and smoke dispersion experts provided up-to-date forecasts on the likely path of smoke produced by the fire. Predicting the path of the smoke plume is important for health reasons as fine particulate matter less than 2.5 microns can penetrate deep into people’s lungs and affect those with asthma or other breathing conditions and, under high concentrations, cause poor health effects for everyone. Smoke forecasting also allows air traffic controllers to minimise disruption to air traffic; helps local councils to make decisions on road closures; Civil Defence authorities to make best decisions about evacuations; and schools or other organisations (e.g. sport or music events) to make decisions about closures or change of venue. The forecasts were produced using a real-time smoke and fire spread prediction tool undergoing development by Scion’s Rural Fire Research Team as part of its MBIE-funded research programme. This team is New Zealand's only provider of specialist fire research expertise in rural and forest landscapes. The research programme focuses on understanding how fires and their smoke are likely to behave in different weather conditions, terrain and fuel types, and factors affecting public and firefighter safety to protect life and property and to manage fire in the landscape.